When I was asked to review Henry’s Cafe Bar recently I wasn’t sure what to expect. I have only eaten lunch there once but it was a long time ago but I am a regular when it comes to their wonderful cocktails. We chose to go on a Friday so that we could experience it on a busy day but we also went early so that it wasn’t so busy that the staff were rushed off their feet. We actually unwittingly picked the time that lots of diners were enjoying a pre-theatre dinner so it was really busy when we arrived but we found a free table and despite the crowds, we were served immediately by a friendly waiter. The menu looked very promising. It was much more refined than we thought it would be and we became very enthusiastic about what was to come. At 7.15, people started to leave but they left behind many tables full of dirty dishes and glasses. Half an hour later, the tableware was cleared away but there were still crumbs and unlaid tables and a washing up bowl left on one of the tables. I can understand that everyone left together which meant there was lots of work to do in a short time but I would have thought that this would have been anticipated as it happens whenever there is something on at the theatre and that more staff would have been on hand to help. Nevertheless, the friendly efficient waiter continued to serve and promptly took our orders. Unfortunately, our top two starters were not available so I chose Avocado with Crispy Pancetta and Spinach. Mr V chose the Shallot Tarte Tatin but that wasn’t available either so the waiter offered him a beetroot (rather than shallot) option instead which he politely accepted. The starters arrived promptly. Mr V’s tarte tatin was beautifully presented but it wasn’t cooked properly. In fact the pastry was raw and he couldn’t eat it. My avocado with crispy pancetta and spinach was better but the ‘crispy’ pancetta was actually lardons and they were anything but crispy and the dish was quite oily and greasy. We ordered another cocktail and hoped the mains would be better. Mr V chose Spatchcocked Poussin with Garlic, Thyme & Lemon and I chose the Chicken & Prawn Jambalaya. My Jambalaya was nice. It had a healthy kick to it and it was packed full of meat making it a fair price at £11.95. Mr V’s main wasn’t quite as described. It was supposed to come with potatoes but the waiter explained it would be served with puy lentils instead. It arrived with puy lentils in a broth with over boiled celery and carrots. The Poussin was very well cooked and fell off the bone which was good but it meant that little pieces of cartilage and bone got lost in the broth making it slightly unpleasant to eat. Feeling disappointed, we moved onto dessert. I soon cheered up when I noticed a Blueberry Cream and Mint Tart but unfortunately, they had run out of that one so I settled for an Apple and Blackberry Crumble and Mr V had a Chocolate Brownie. Both were well presented again. Mr V’s brownie was ok but it was a little dry. My crumble looked nice but it tasted very average and came with a jug of tepid custard that didn’t know whether it was supposed to be hot or cold. All in all, the food was disappointing on this occasion. It’s a real shame because for drinks Henry’s is a real favourite of mine. I used to frequent it as a student for cocktails many years ago and now it is a favourite for after work drinks or on a night out. It’s the kind of place where there is a combination of people wearing suits, jeans or even fancy dress and everyone feels at ease, there is no discrimination. I like the decor and the staff are always friendly. Our waiter on this visit was excellent but the food just didn’t hit the mark. Henry’s call themselves a Cafe Bar but I’m not sure that this fits with what they are offering. It seems to me that they are trying to do too much and as a result they are serving confit of duck with a bottle of ketchup which just doesn’t work. For drinks, this is a great choice but with so many other options for dinner, I think I will go elsewhere in future. 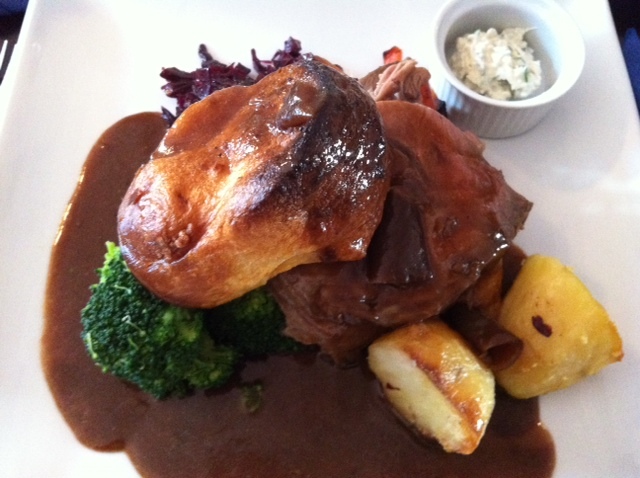 Fusion Cafe Bar- Sunday Roasts like Mum makes! Following a recent invitation to lunch at Fusion Cafe we were invited back a second time so we decided to try out the Sunday lunches as they are Fusion’s speciality and have become quiet popular. I really like Fusion Cafe. The decor is quirky with mis-matched chairs, tables varying in size and some great arty features like a light made out of many bulbs tied together and a colourful paper-mache stag head wall mount. Drinks lists are tastefully painted onto the wall above the bar and there is more graffiti style writing leading you to the toilets. I think the decor would really appeal to my female friends but Fusion are also keen to increase their male visitors as currently girls do seem to dominate. While we were there, Mr. V was the only man but I found this strangely refreshing and he certainly didn’t seem to mind. On a Sunday, Fusion have a different menu than that of the rest of the week. They serve three courses and there is a fair amount of choice but for the main you can only have a roast dinner, although there was a choice of three when we were there including a vegetarian option. On my previous visit we had lunch on a Saturday which was more of a lunch menu of light bites. I had a duck wrap and my friend had a rather tasty vegetarian burger. The menu has since changed as Fusion have branched into evening menus which look very good. Anyway, back to the Sunday Roast! I can honestly say, this was the best Sunday lunch I have had in a long time. I am a Sunday roast fiend but Mr V finds them a bit on the dull side so I wasn’t expecting much enthusiasm from him but he wouldn’t shut up about it! He said it was the best Sunday Roast he has had in Cardiff (and them promptly added ‘apart from yours’. I have him well-trained…). I had the beef option and Mr V had the chicken. I chose the beef as I wanted to try the horse radish sauce which I had heard was handmade. We were delivered two plates of well presented yet still homely looking, roast dinners with a large selection of vegetables, a generous helping of meat and homemade gravy. I particularly enjoyed the vegetables. We had braised red cabbage (I’ve developed a liking for this recently), honied carrots, parsnips and broccoli. Something that pleased me was that I had a decent portion of potatoes and they were all roasties. I get very upset when I order a roast dinner and I am presented with boiled potatoes or mash. The yorkshire puddings were hand-made and as they should be and the horse radish sauce was certainly a welcome addition to the meal. Very nice indeed. We were full from our dinner but the waitress tempted us with dessert. On my previous visit, desserts were bought in and I wasn’t overly impressed but they are now hand-made by the chef and are far nicer. 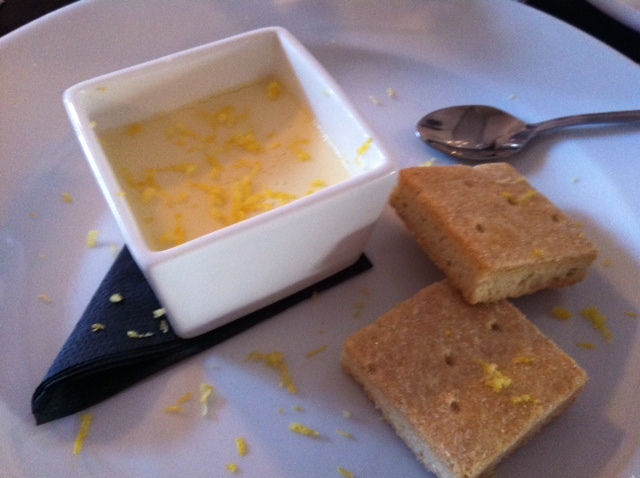 I went for the lemon posset. I had made one when friends came to dinner so I wanted to see how it compared to mine. I have to admit that it put mine to shame. It was creamy and zesty and even came with homemade shortbread biscuits. Mr V had a pear and almond tart which was also very nice. It was crumbly, sticky and sweet and a real home cooked favourite. At under £5 for a dessert and under £10 for the roast dinner, I think Fusion is extremely good value. For the prices they charge, you could easily be served up boil in a bag style Sunday Roasts somewhere else. I’d also like to comment on the service. It’s rare that service is bad but for a cafe bar like Fusion which could really be the type of place you order at the bar, service is excellent. On both visits I was served by the same waitress and she was a credit to Fusion. She was friendly and chatty but also very professional and eager to please. As well as great table service, it was the little things that we noticed. When she saw us squinting at the desserts board, she picked it up and brought it over for us. When our drinks were running low, she offered us more and when we declined, she brought us glasses of water in case we became thirsty while eating dessert. I really like Fusion. For a Sunday Roast it is an excellent option and an excellent price. I’m looking forward to trying out their evening menu too. The Pear Tree- would you like an empty bowl with that? A few weeks ago, my friend Mrs. J and I went out for a bite to eat at The Pear Tree in Roath. A few people have told me that I need to get down there and give it a try and I’ve been meaning to for a while. We walked in and it immediately felt nice and welcoming, I often feel intimidated when I walk into pubs but I didn’t at all at The Pear Tree. The Pear Tree describe themselves as a cafe bar and I think this is a fair description. It’s clearly a bar but it has the coziness and relaxed feel of a coffee shop. The decor is very unusual and is set out like an old house. There are book shelves, ornaments and lamps and old portraits on the wall that look like they came straight out of a museum or a very elderly relatives house. There was even an old style sewing machine thrown into the mix. We found a table for two and looked at the menu. The menus were on A4 paper but also displayed on boards around the room. There was also a tapas checklist on the table which you could take to the bar so you didn’t forget which tapas you had tried which was a good idea I thought. I was a little disappointed by the choice of food available, the menu was quite uninspiring. We had gone for an evening meal but they seemed to cater mostly for lunch and breakfast with lots of sandwiches and paninis. However, after we had ordered, I did actually see a board of specials which would have been a lot better for an evening meal than what we picked. I ordered a spiced chicken breast burger with chilli jam and minted creme fraiche with chunky chips and Mrs. J ordered the tapas deal- 3 dishes with a drink for £7.95. She chose spicy chicken wings, meat balls and squid. When it came to ordering the meals, we did have a few issues. While staff were very friendly and accommodating, they made a few mistakes. Firstly with the tapas Mrs. J was allowed a continental beer or a glass of wine. She wanted the beer but as this particular beer had run out, they didn’t offer her a different one, she was only allowed wine. I thought this was pretty poor and she should have been given the option of a different beer. Mrs. J ordered bread and olives as an appetizer and half way through eating the bread, we noticed that she hadn’t got any olives, in fact she had been bought an empty bowl! Staff were quick to rectify this though but we were baffled as to how you can go as far has getting the bowl out and then forgetting to put the food in it! When our mains arrived, my burger was pretty small for the price I paid for it. It tasted fine but it didn’t come with the minted creme fraiche so I asked the waiter about this and he bought out a little pot of it. Mrs J enjoyed her tapas, especially the wings which were marinated in a spicy sauce. Not quite full, we decided to have dessert. 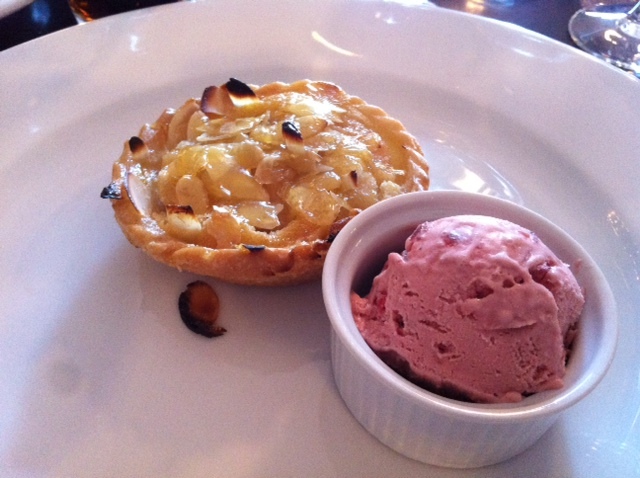 We chose apple rhubarb and gooseberry pudding and chocolate and cherry fondant. Both were mediocre and clearly bought in. They were a bit dry so we could have done with a bit more ice cream. All in all, I won’t rush back to eat at The Pear Tree but it is a lovely place for a drink. It has quite a ‘first date’ feel to it. The food wasn’t bad, it’s what you would expect from a Brain’s pub but when it comes to food, with other independent places in the area, I would choose them for food over The Pear Tree.